Melbourne is a city with an atmosphere. There is more to do in this thriving metropolis than any person or couple will ever manage. Rather than return to the Botanic Gardens or jump on yet another river cruise, we have compiled a list of ‘off the beaten track’ ideas, perfect for any kind of date. Try some out to impress your partner and give the perfect backdrop to any special meet. The perfect dating spot for a first date should be somewhere interesting, quirky, and with enough to distract you if the conversation does not flow as easily as you would hope. The Butterfly Club checks all those boxes with cabaret, comedy, music and delicious cocktails. Rising stars, household names, new artists and firm favourites, there is really something for everyone. Shows are on 6 nights a week, and the kitsch decorative choices around the bar will prompt even the most stilted date into delighted discussion. Whether you are double dating, or heading out with a group of couples, Escape Rooms are all the rage across the world. In Melbourne, one of the best options is Escape Hunt which offers five different game options to choose from. Escape Rooms are fantastic for double dates, as all participants work together as a team to break out within a given time limit. Relying on each other’s strengths, there is a lot about personality types and weaknesses. Additionally, singles get a chance to see what their date is like under serious pressure. The experiences are usually under 90-minutes end to end, and leave enough time to grab a drink afterwards. For those looking for something special and romantic to mark an occasion, Paris Cat might well be the answer. Up there with some of the best jazz bars in the world, they feature live jazz four nights per week, with excellent wine, gourmet Tapas and a really chilled and intimate setting to encourage the romantic mood. Couples looking to eat rather than listen, should head to O My in Beaconsfield. An award-winning seasonal menu makes them one of Time Out’s top 50 restaurants in Melbourne for a very good reason. You are being set up, and you have no idea which way this date is going to go. Blind dates could mark the beginning of a beautiful love story but could also turn out to be the most boring date of all time. A good spot for such an occasion should be somewhere with potential, but no commitment involved. A bar is a great choice, and one of the best in Melbourne is The Croft Institute. Quirky and fun, there is a lot to chat about, including the innovative and exciting cocktails which are always changing. Stay for one drink and wish your date a good night, or drink and dance into the evening, making plans for a follow up dinner before you head out the door. We could write a whole article about the amazing breakfast joints Melbourne has to offer, with the best coffee and the perfect pancakes. However, if you are looking for somewhere which should please the masses, we absolutely adore Breakfast Thieves and we are sure you will, too. Built in an old chocolate factory, they have a ton of fantastic options, from a carnivore’s delight, to a perfect vegan brunch. Many options for meals can be made gluten free on request, and include enough superfoods and variety for the foodie at the table, while still promising a hearty meal for the more traditional of the bunch. The Malaysia Kaya French Toast is definitely worth a try. Craft beer, comfy seats and a whole lot of geeky fun. Alchemists Refuge is a den of nerdy board games and role playing laughs, which does not take itself too seriously. If you only have an hour or two, grab a drink and play a game, and we guarantee you will wish you had longer. This is a great spot for a quick after work date, as they open at 5pm most days, and it tends to be pretty quiet until the evening starts proper. Couples planning a weekend away or a night out of the city might be surprised by Phillip Island. There is more to do here than just attract tourists, with motor sports, shopping, excellent restaurants, and of course the wildlife spotting. When you are all tuckered out from seeing the cutest penguins on the planet, the Island Bay Ranch is one of our favourite resorts for couples, featuring boutique rooms for seclusion and comfort. If you are looking for a relaxing break rather than an active one, massages, treatments and spa extras are available in multiple locations on the island, as well as some of the most gorgeous beaches in the Bass Coast Shire. Need some help getting your flirt on? 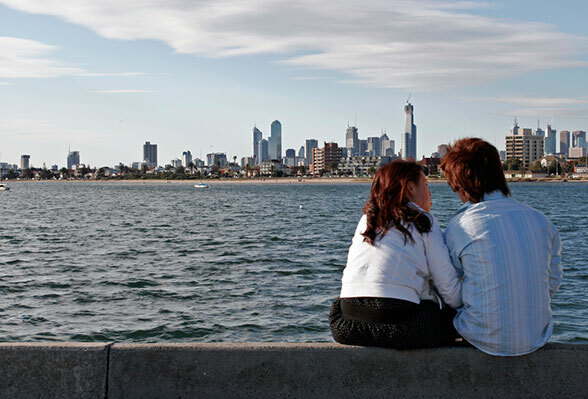 Check out our handy advice for flirting and meeting new people with Aussie dating sites.